Bachelor of Science Degree in Transportation Design at the Art Center College of Design, Pasadena, California in 1992. Product Design Consultant for Ashcraft Design in Santa Monica, California, designing home consumer electronic products for major companies such as Harmon Kardon, JBL and Cybex. 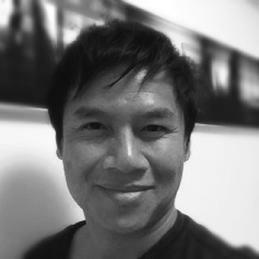 He moved to Tokyo in 1993 and was designing both car exteriors and interiors for Mercedes-Benz Advanced Design Studio, Yokohama, Japan. In 2000, he was headhunted to join Nissan Global Design Center, Astugi, Japan and designed the GT-R Concept car interior which debuted at the Tokyo Motor Show in 2001. For the 2003 Tokyo Motor Show, he designed the Serenity Show car, a luxury MPV proposal using artistic influences of Japanese DNA in the design language. From 2005, he was the exterior design team leader for the 3rd Generation Nissan Cube and his proposal was selected to go into production and was launched at the LA motor show in 2008. During this time he also designed the Denki Cube show car interior which made its first debut at the 2008 New York Motor Show. His work has been published in magazines, such as Esquire, Japan, Car Styling, Auto & Design, Cardesignnews.com, EVO, UK, and INTERSECTION.